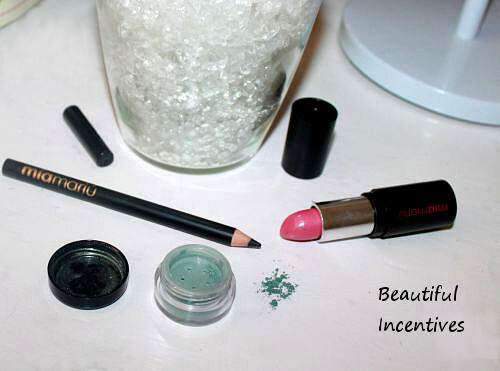 Beautiful Incentives: Mia Mariu Review & Giveaway! Mia Mariu Review & Giveaway! I am on a constant attempt to find quality products that are all natural and cruelty-free, that don't irritate my skin. I have very sensitive skin and I'm glad to report that Mia Mariu is a line that agrees with my face and my taste. They have a beautiful selection of unique colors. It was hard to choose! This review has a look geared more toward spring, but I just went with where the colors took me and that was to my shirt that happened to be right next to me. The colors matched perfect to it. Regardless of it being out of season, I think this would complement a wintery look in an instant. Throw on a cream colored or green sweater and match it with a pink scarf and voila. I think any set of colors can be great for all year round, depending on how you use them. Hydrating stick gloss in "Beso"- This shade of pink is absolutely gorgeous. I would describe it as a classic bubble gum pink. I found the application to be very smooth and easy to apply. I would say that this falls between the category of lipstick and lip gloss. It applies very glossy with tons of shine, but still maintains the lipstick feel. It was very emollient on my lips. Also, this isn't important to mention, but I like the scent of it. It's just a subtly sweet smell that reminds me of candy or bubble gum. 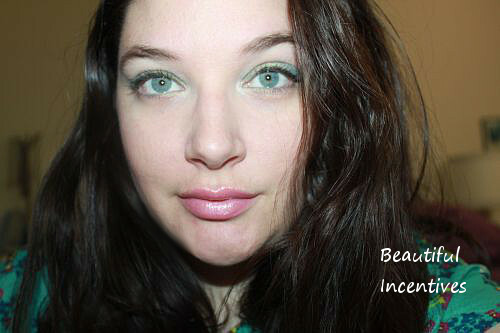 Loose mineral shadow liner in "Aquamarina"- This green is sooooo pretty. I've never tried and teal/aqua color beofore. Well, not since my early teens when i had no idea how to apply it. I'd line my inner lash, because it's what we did and I was cool. Alas, it's a huge no no now. It went on incredibly smooth and it has the most beautiful sparkle. I paired it with a white shimmer in the corner creases and blended it into the lower lid, which gave it a yellow shade in that area. Just a lovely shade of green that coordinated perfectly with the lipstick. Intense eyeliner in black- This eyeliner went on very smooth, but I have to say it wasn't all that intense for a black. It was black as can be, don't get me wrong, but I have seen blacker. I did a classic wing, not too thin or thick. It was perfect to bring out my eye color and really make the lippy and eyes pop. Overall, I am thoroughly pleased with yet another cosmetic line that doesn't make my skin rebel me. It's nice to know you have choices and new companies are popping up every day. Mia Mariu is a beautiful line and I am definitely going to check out more of their products. If you liked this review, I highly recommend you check out their website. Mia Mariu is about beauty inside and out and with that they carry supplements and makeup combined. I am always happy to announce when a company gives back and Mia mariu does just that. They support the Wounded Warriors Wives, which is a program dedicated to inspiring and comforting the women who sacrifice themselves to care for our country's wounded warriors. By purchasing from their line, you help them donate to a great cause. Today, I'm really excited to have the opportunity to give away 3 of the same products to one lucky gal!! I absolutely LOVE Their products and they look GREAT on you! Love the colours! They make your eyes pop! Thank you for sharing this product! I love the colors and you apply the makeup so well. I can't wait for the giveaway, count me in! I love the color! You did a wonderful job on your eyes! I will be back for this giveaway too! beautiful colors on you! Looks great, I really love Mia Mariu. That shadow looks great on you! The eye shadow looks awesome with your eyes! Very pretty! That is a beautiful color on you! I love Mia Mariu's products! They never break me out, and they look great! I love the eyeliner! All the products look gorgeous on you! Ya you rocked it girl, Love it. I'm so glad I stumbled onto your blog today! Great giveaway! Your eyes look fantastic! Thank you for stopping by. I love and appreciate new reader feedback! Thank you.